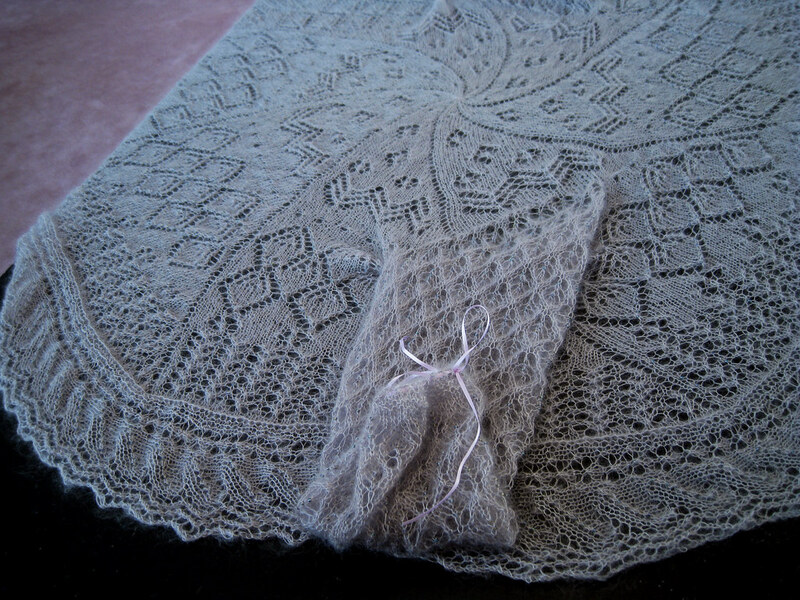 I slogged my way to the finish line of the shawl body a few days ago. As you might imagine, I am very tired of pink. I have miles of edging to knit on before the thing is completed, but I am putting it aside for a while to let my Pink Receptors recover from extended stimulation. Cindersall's reversal of the crown motif was masterful, and I think it looks better than the original. 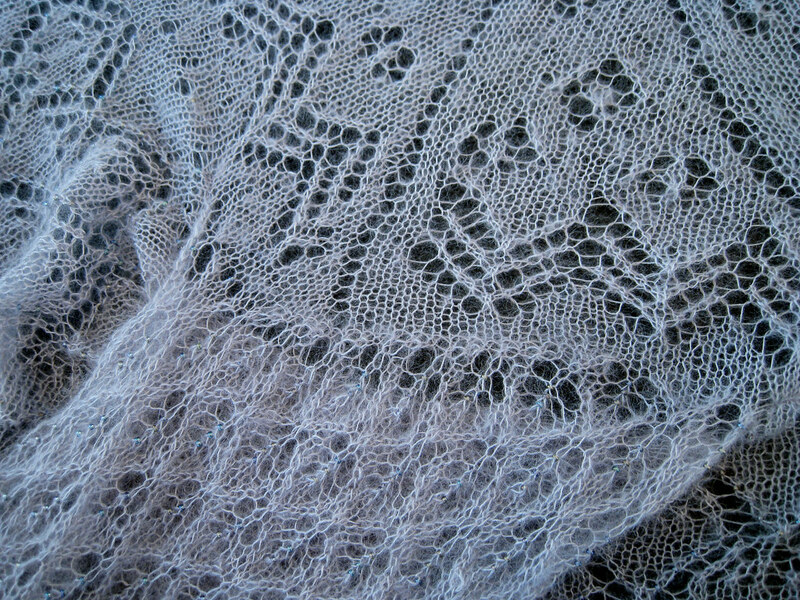 Having carefully placed the Bat shawl on the bottom of my UFO pile, I decided to treat myself with my rendition of the Honeysuckle shawl/sweater thing, which appeared in Issue #6 of The Knitter. This design is beautiful--elegant, graceful, and feminine. 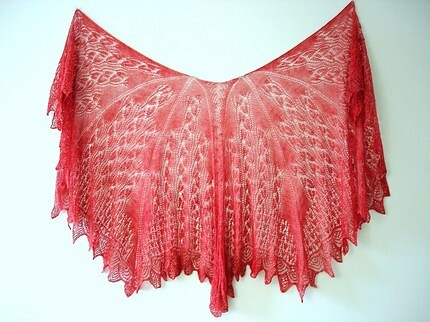 I had to read the directions four times because I simply couldn't believe that the designer would actually take a round shawl and convert it to flat knitting. Thus, the reader is instructed to knit across the pattern row, turn, purl back, and then, when the piece is finished, sew up the back seam. Nah. 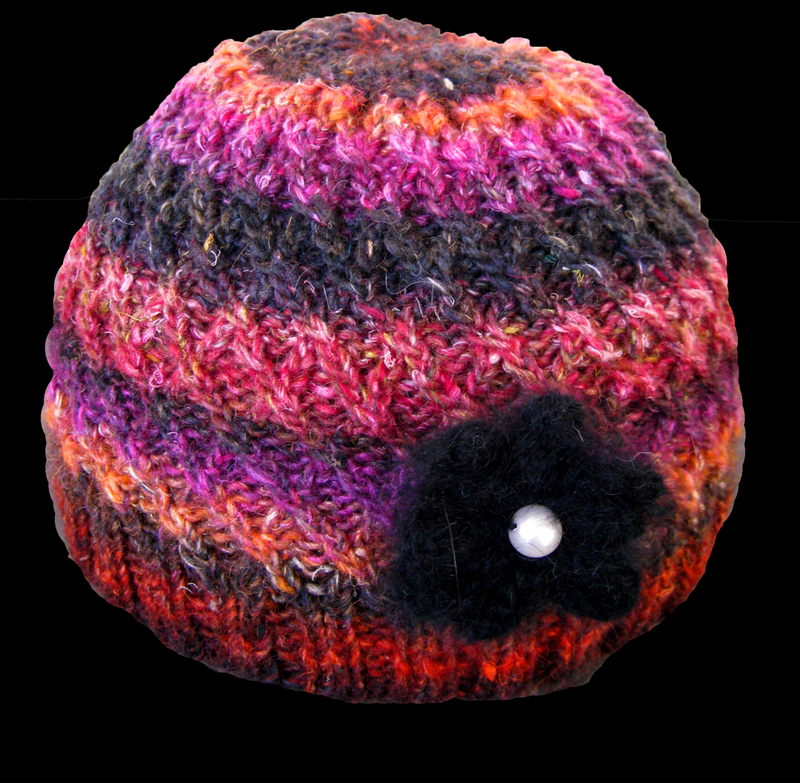 I am knitting it in the round like a grown-up. 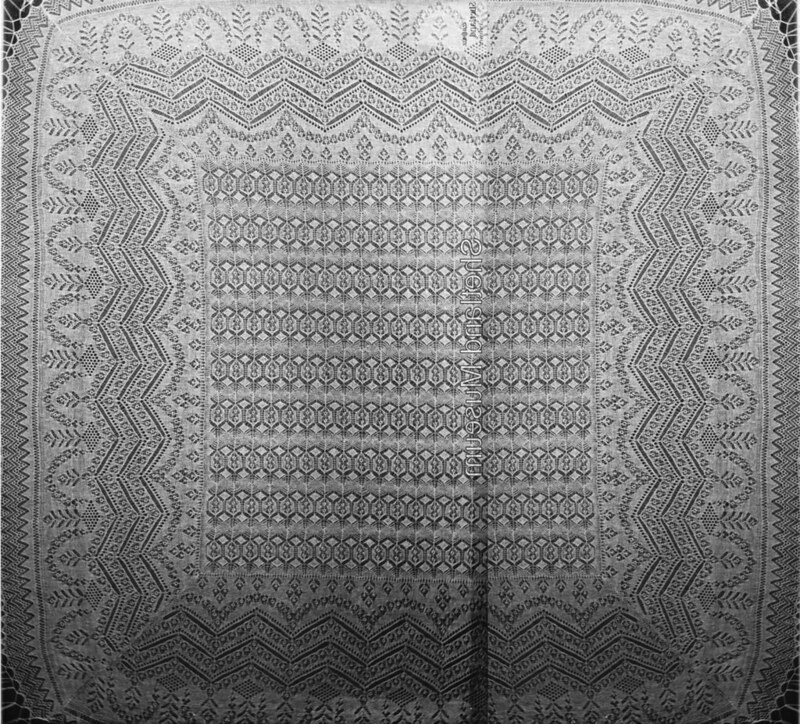 For the sleeves, the original design calls for casting off 40 stitches one one row and then casting on 40 stitches in the next row. The sleeves are knitted separately and then sewn into the gap. 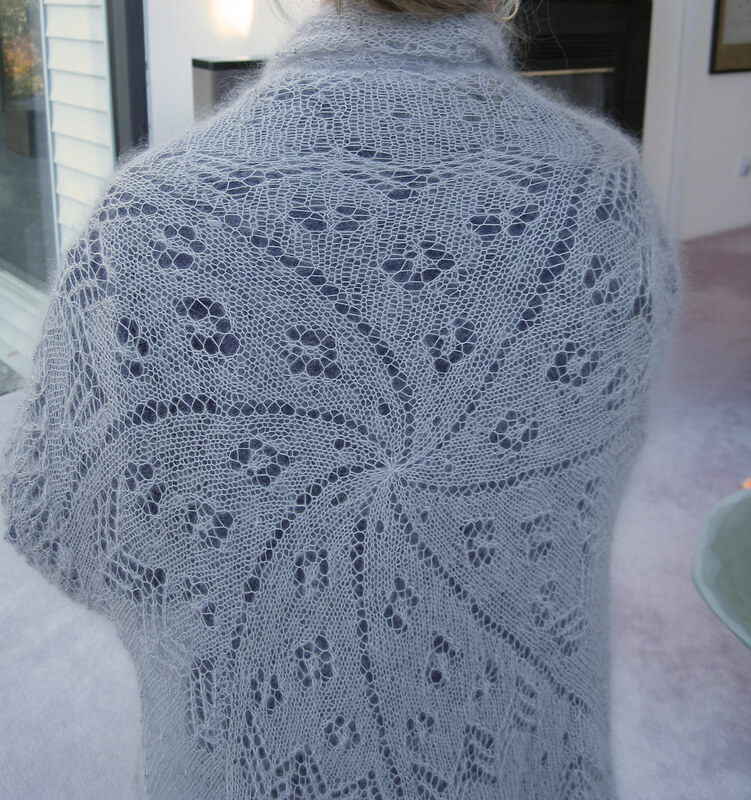 Why make an ugly seamline at the shoulder and force the knitter to do even more sewing? 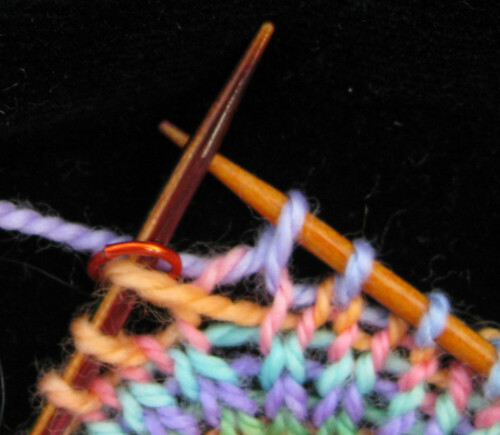 Instead, I will knit a contrasting piece of yarn over 40 stitches. When I am ready to do the sleeve, I will carefully undo the contrasting yarn, pick up the stitches around the armhole, and knit the sleeves from the top down to the wrist. In an incredible display of foresight, I decided to bead only the sleeves and the front side of the sweater. I realized that if I beaded the entire thing, I would wear the sweater once, wonder why my back felt like llittle glass beads were digging into it, slap my forehead, and put the thing away forever. 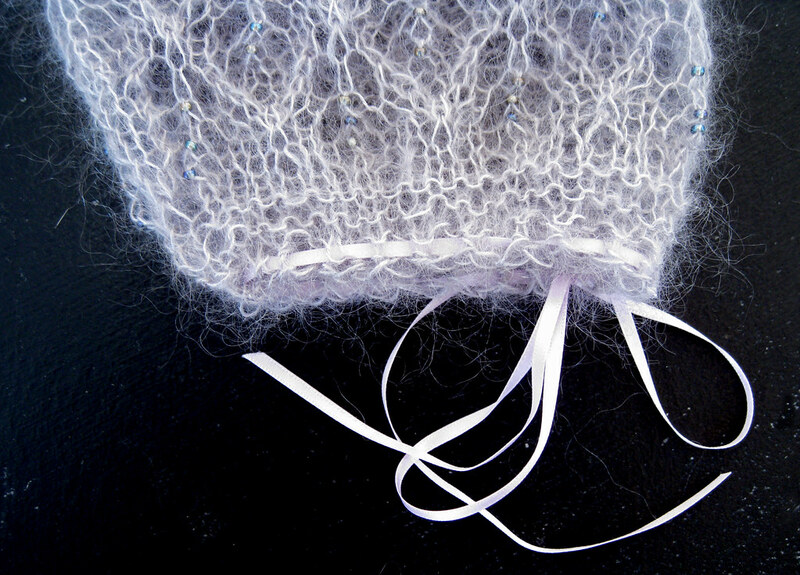 I am using Hamanaka mohair/silk Parfait yarn and some pretty beads that have been languishing in the closet for a while. Harry finds the piece rather restful. Too restful. I have to shake him out of the thing every time I want to work on it. It will probably become a scarf for Kyoko-san if Harry doesn't filch it and bury it in his stash drawer. I've never been a fan of short rows, mainly because I've never been able to make them look pretty. I've tried all the techniques--yarn overs, Japanese, wrapped, unwrapped, rewrapped, and encroachment-- and frankly, they all look hideous. Or worse, one side looks nice and the other side looks hideous. 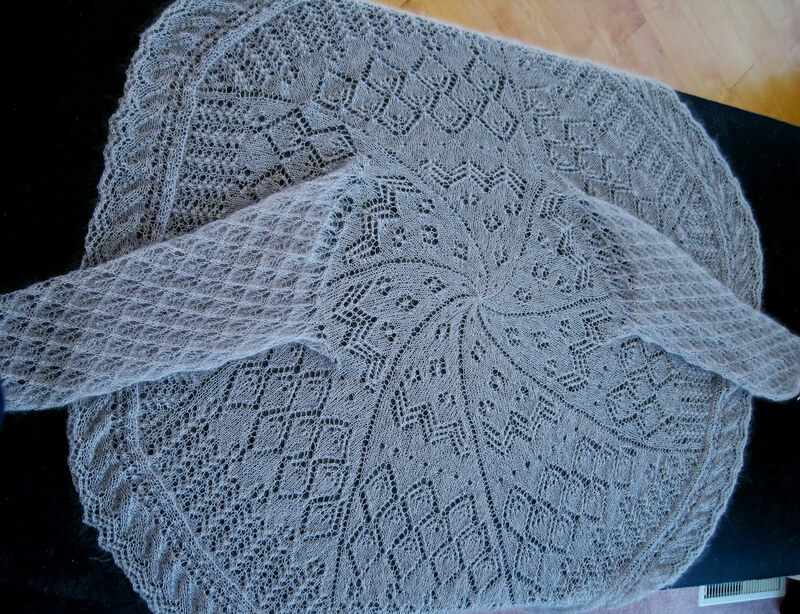 Every so often, I pick up my needles and fiddle around with short rows. But it wasn't until yesterday, as I was dozing in the car, that I came up with a new short row technique that actually looks attractive, is symmetrical, leaves no holes, and doesn't require wrapping or safety pins. Those familiar with the fleegle heel will find the concept similar. 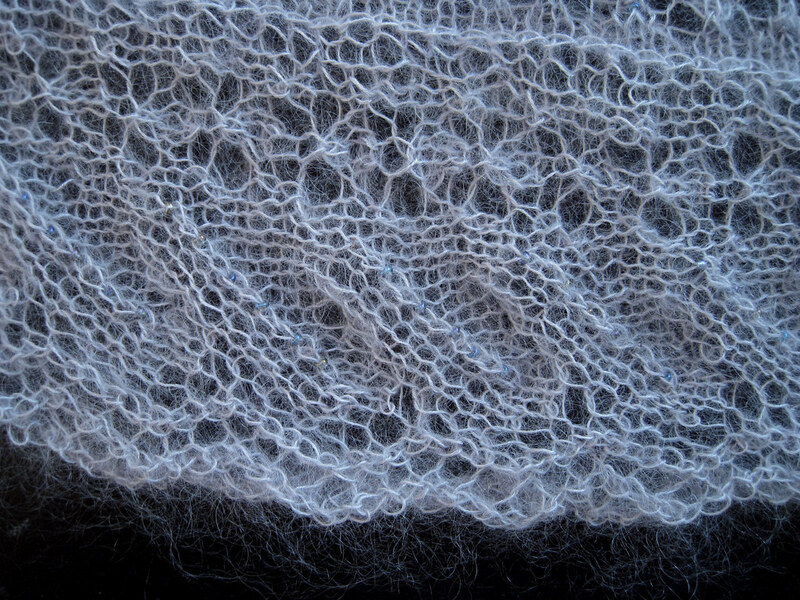 The only difference is that you are not spacing out the increases to make a gusset. You'll see what I mean when you work the sample (assuming, of course, that you have tried the fleegle heel). If you want to try this out, I suggest you cast on 20 stitches. Knit a few rows and place markers around the center 10 stitches, because it will be between these two markers that we shall build a little nose. Note that all slipped stitches are slipped purlwise. ...and knit through the loop. You now have 11 stitches between the markers. Turn. 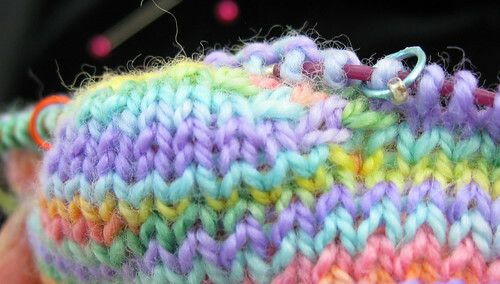 Slip the first stitch, which is your "new" stitch, and give it a little tug to tighten it up (important!). 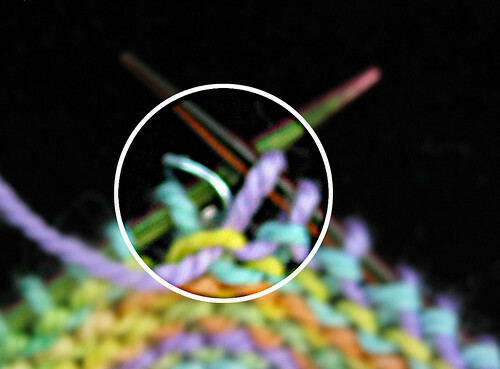 Before you proceed, please look carefully at the two stitches on the right needle. They are a pair under a single bump and the pair straddles the marker. I call it "1 pair." You now have 12 stitches between the markers. 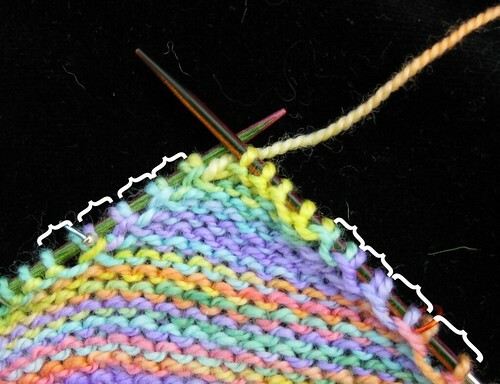 Notice that you have made another pair of stitches under a single bump straddling the marker. 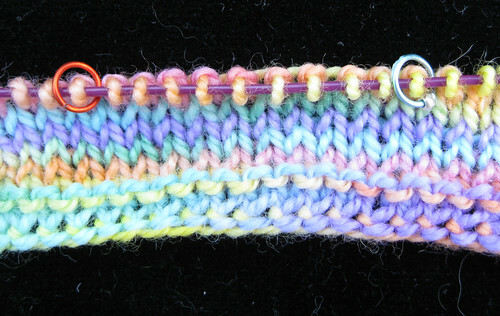 Turn, slip then first stitch, give it a little tug to tighten it up, and knit 9. 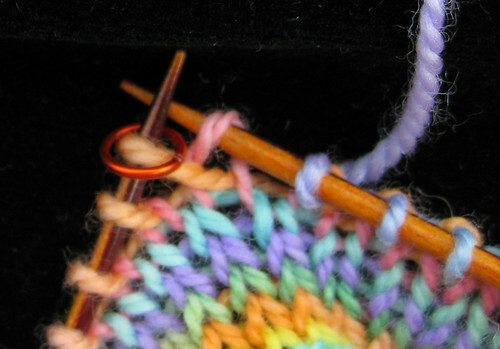 Put your needle through the bump behind the next stitch and knit it. You now have 13 stitches between the markers, and two pairs. 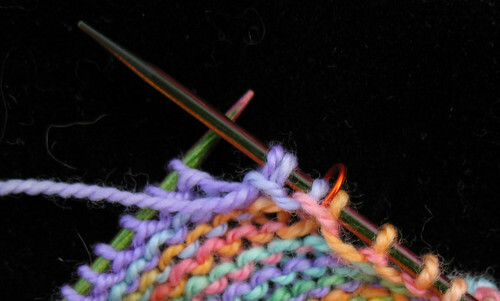 Turn, slip the first stitch, purl 8. 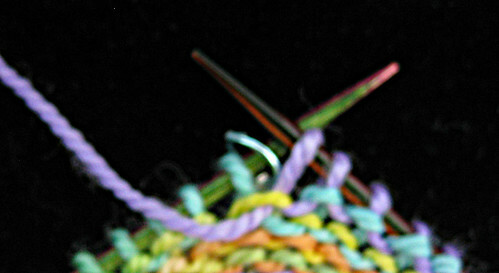 Put your needle through the bump below the next stitch and purl it. 14 stitches are now between the markers and 2 pairs. Turn, slip, knit 7. Pick up the bump in back and knit it (15 stitches between markers and 3 pairs). Turn, slip the first stitch, purl 6. 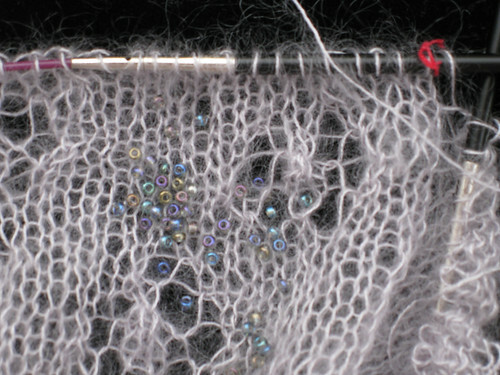 Pick up the bump in front of the stitch you just purled and purl it (16 stitches between markers and 3 pairs). 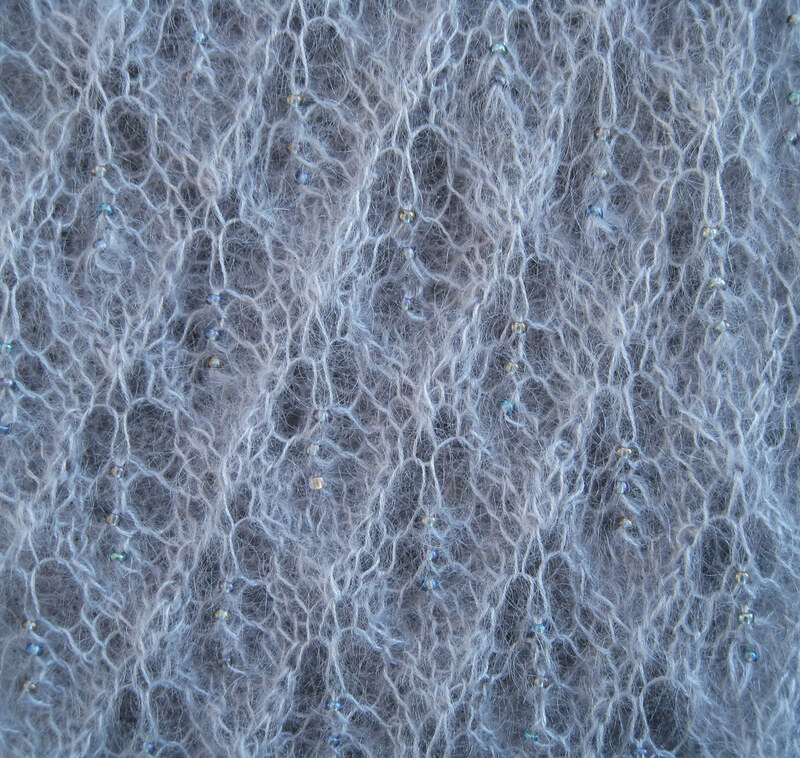 Turn, slip, knit 5. Pick up the bump in back and knit it (17stitches between markers and 4 pairs). Turn, slip the first stitch, purl 4. 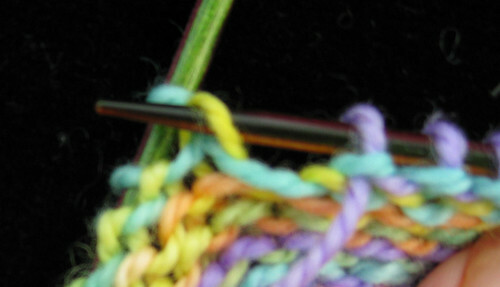 Pick up the bump in front of the stitch you just purled and purl it (18 stitches between markers and 4 pairs). Now we are ready for the second half of the short rows. 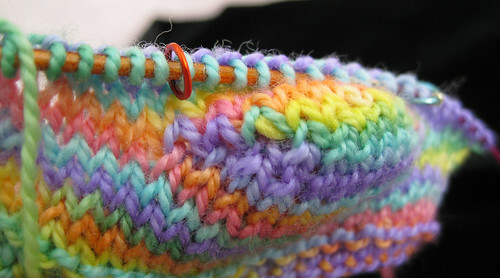 The basic concept is that you will knit (or purl) one stitch further on each side by knitting (or purling) two stitches together. 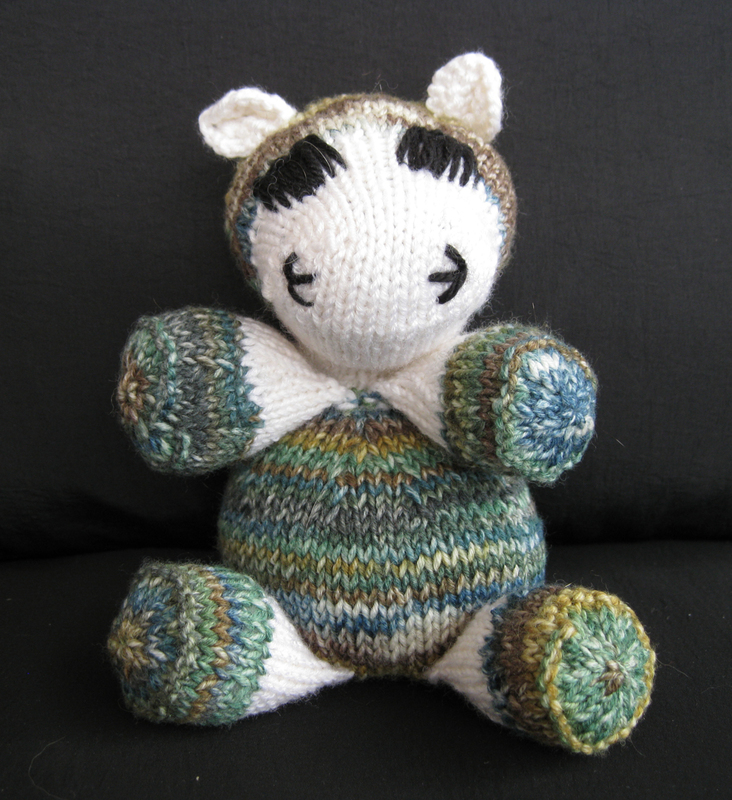 Do pull out the slack when knitting these. Otherwise, you'll have loose stitches that will make you sad. 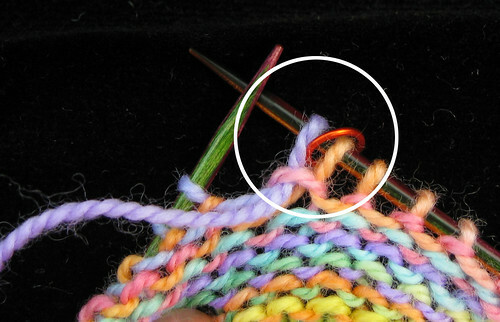 Here is an annotated photo showing which stitches get knitted together. 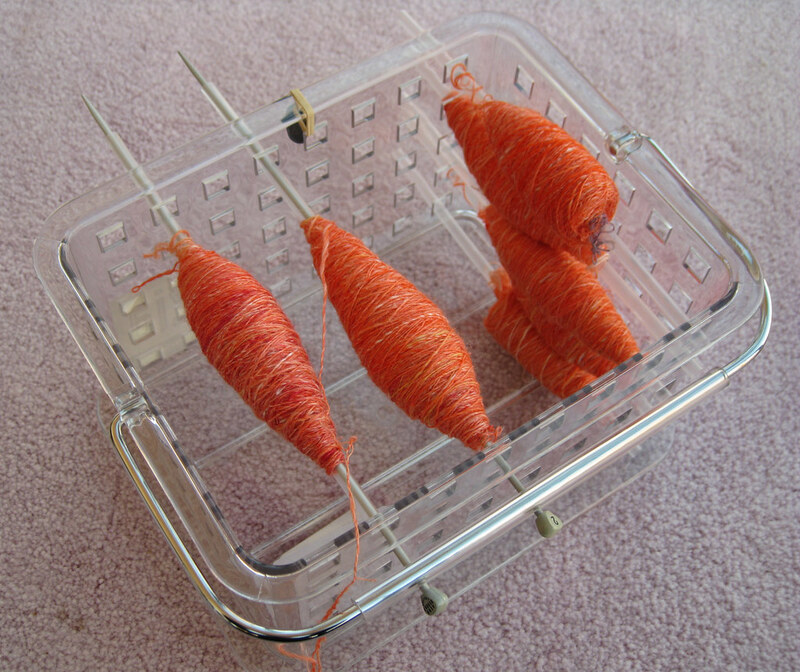 Turn, slip the first stitch, knit 5, pull on the yarn to remove slack, knit 2 together. 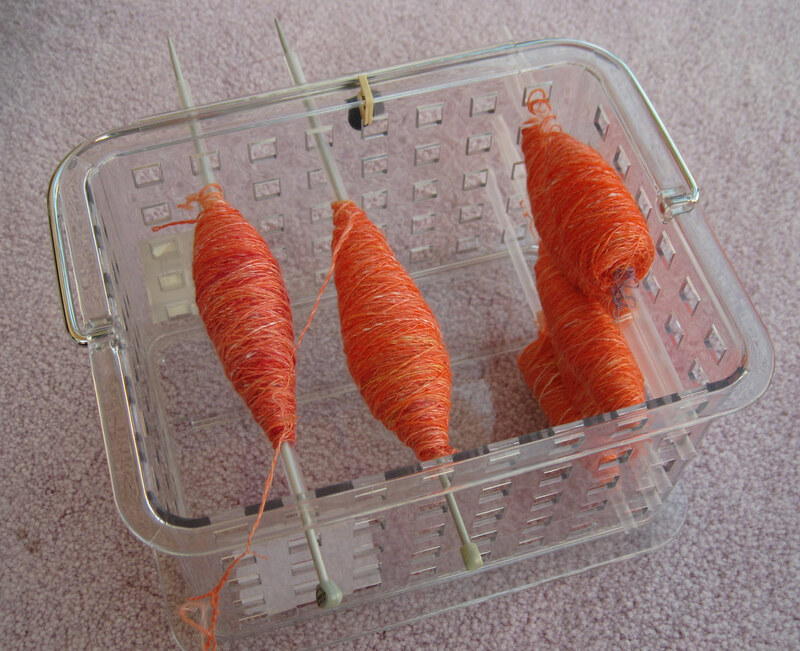 Turn, slip 1, purl 6, purl 2 together or purl 2 together through back loops. I prefer the way P2tog looks, but you may like P2togtbl better. Turn, slip the first stitch, pull on the yarn to remove slack, and knit 7. Note that the 7th stitch is the K2tog from the previous row. If you make a note of these decreases, you won't get confused as to how many stitches you should be knitting or purling plain. 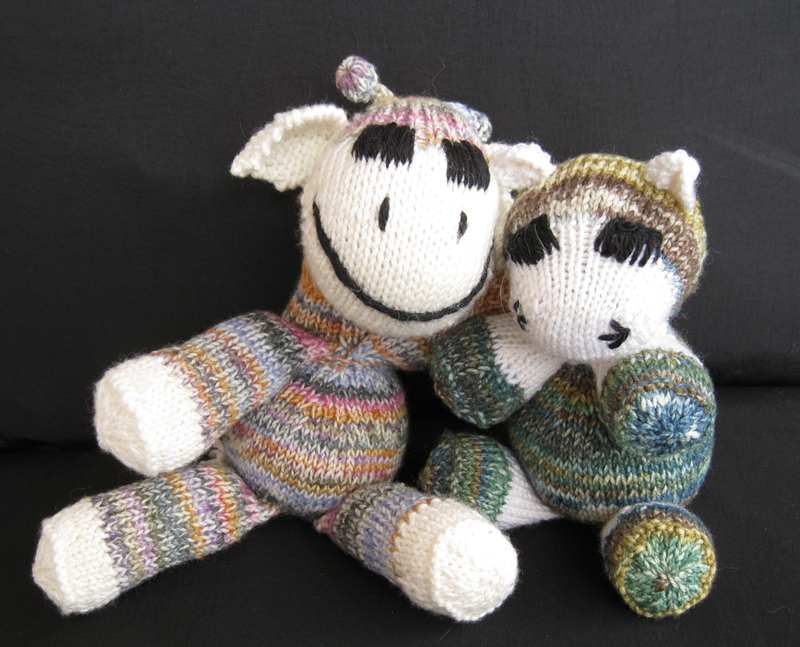 Knit 2 together. Turn, slip 1, purl 8, P2tog. Turn, slip the first stitch, knit 9. K2tog. Turn, slip 1, purl 10, P2tog. Turn, slip the first stitch, knit 11. K2tog. Do not turn. Turn. Purl 12 across the center markers, P2tog. Given this basic technique, many modifications are possible. 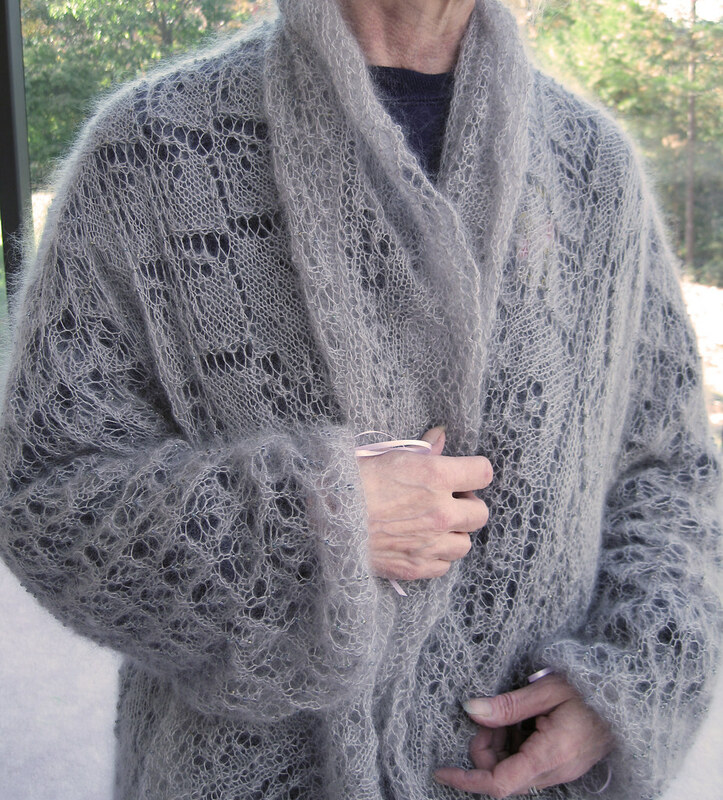 You can use a different increase (knit front and back, for example). And you can change the directions of your decreases. Experiment and see what works best for you. If you have an improvement, do let me know! The instant I hear those words spoken, I have an immediate urge to run off and Do That. Or figure out a way that It Can Be Done. I would guess that about 80% of the time, You Can Do That, although doing so might turn out to be expensive, awkward, or embarrassing. Or all three. One of the biggest Can't Do That's around in Fiberland is the myth that you can't spin long fibers, such as silk and alpaca, on a charka. 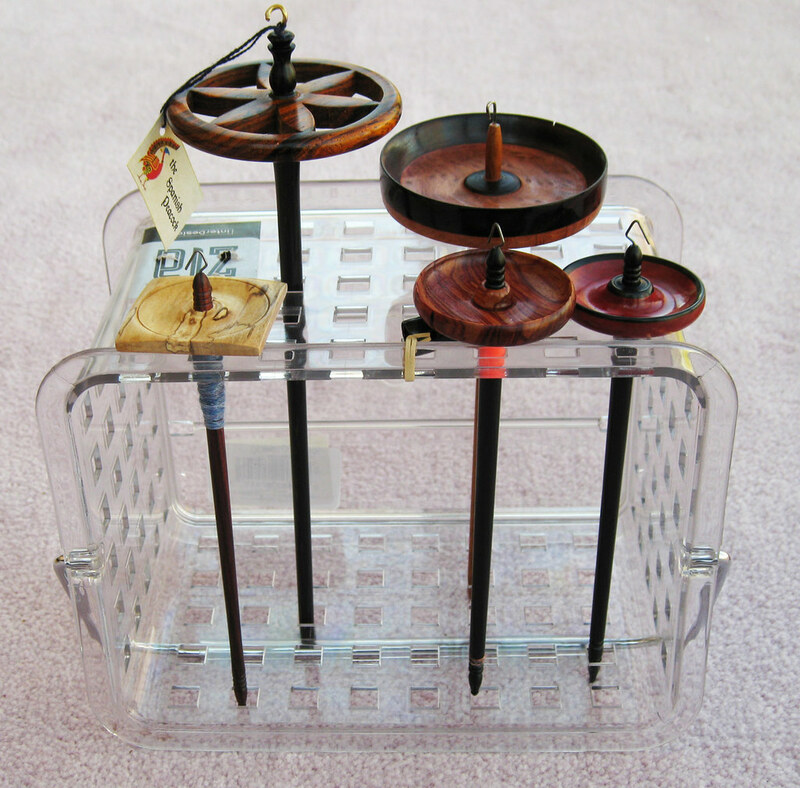 For those unfamilar with this device, it's basically a compact spinning wheel originally designed for spinning cotton. Closed, this size of this elegant machine is a bit smaller than a hard-backed book, hence its name book charka. 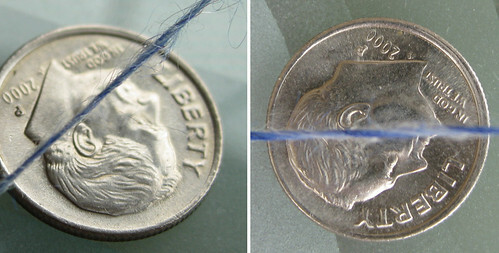 Spinners use charkas for other short fibers, such as cashmere and camel, but the First Law of Charkaness states that for longer fibers, You Can't Do That. Having received this gorgeous cherrywood Bosworth charka as an early birthday gift, I dutifully spun the enclosed sample of mindnumbingly boring white cotton and then fooled around with some cashmere and camel. Okay, got the concept. Now on to the You Can't Do That fibers. 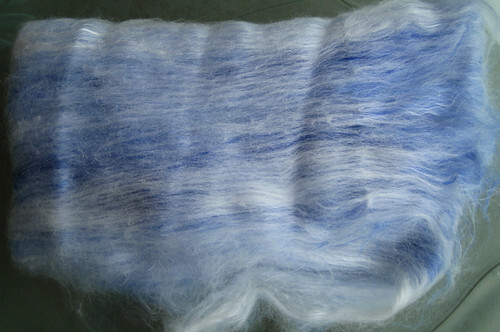 Out comes a lovely silk/merino batt from Corgi Hill Farms. These batts are not carded to homogeneity. 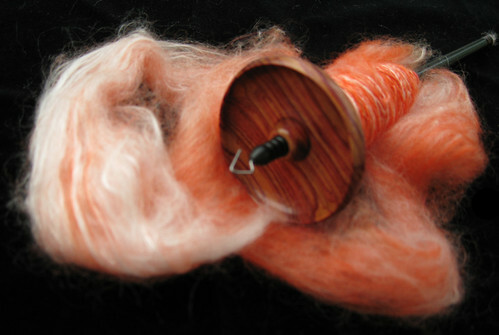 Instead, the long, lush silk fibers are layered in between the beautifully dyed merino. Contrary to expert opinions, not only can silk be spun on a charka, it spins beautifully with nary a blob.The stuff was just meant for long draw. It spins thick, it spins thin, it spins any way you like your yarn. Here are some samples--medium, thin, and really thin. Of course, the spindles on the Bosworth are small and delicate, so spinning yarn of this weight would fill them up in a few minutes. However, I have a Babe charka too, which sports a spindle fashioned from a nice, big knitting needle (courtesy of a fortuitous swap with Janice in Georgia). That spindle can hold almost as much as a clunker drop spindle. So there. I figured I was on a roll, so I pulled out a one-ounce spindle and spun some gossamer laceweight from the batt. 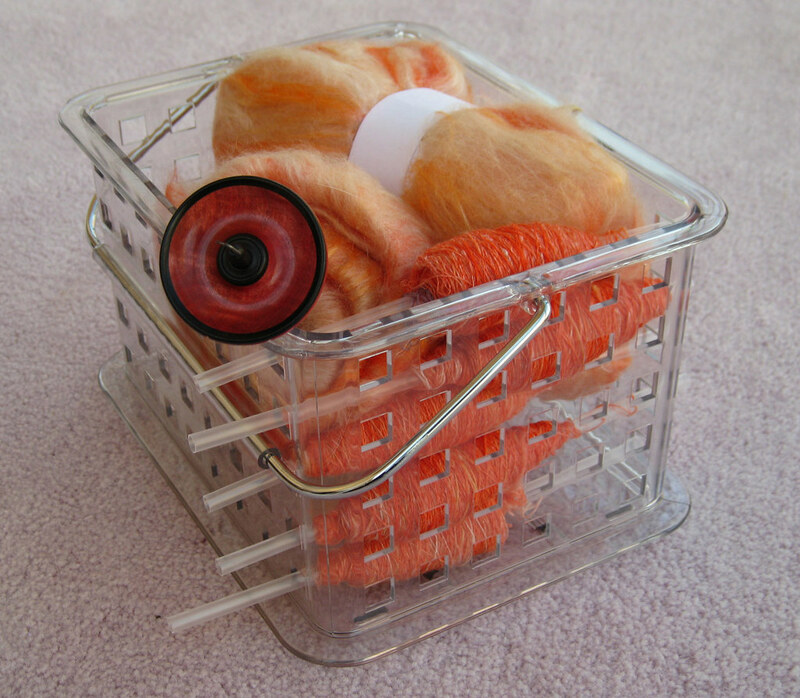 Current opinion is that you can't spin gossamer-weight on a spindle that heavy. I went up to the heaviest weight spindle I own, a 1.2 ouncer. And spun gossamer on that too. All this, by the way, was accomplished in my round kitchen, which, when we requested this eccentric design from a herd of architects and builders, were told: "You Can't Do That." Finally and at last, I have set up my Etsy store. It isn't complete, by any means, but there are enough seductive yarns, fibers, and tools to at least look mostly like a Real Shop. Harry is working hard at adding other items and as soon as he returns from his karaoke bartending class, I'll make sure he uploads some more stuff. I hope you at least enjoy looking at our shop. Of course, both of us would be especially delighted if you bought something, but I refuse to follow Harry's suggestion that I whine, wheedle and beg. Until later. If needed. 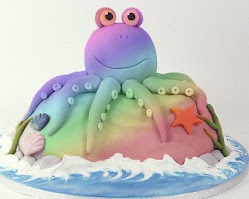 Do take a peek and have fun! Traditionally, silly season is the period starting in late summer, sometimes called the Dog Days of August. History tells us that this is the time when newspapers, lacking in substantive news, publish stories about three-headed watermelons, alien-infested knitting magazines, and sightings of purple fungi growing on Capitol Hill. I don't have anything that exciting to report, although we did have a bear wander up to the back door in search of a snack. Who knew that bears could give you puppy-dog eyes? Being of sound mind, we did not open the screen door and toss out any bear kibble. Barnabas then proceeded to strip our fig tree of fruit and then wandered up the hill to have dessert at our neighbor's plum tree. My personal silly season began with boredom. 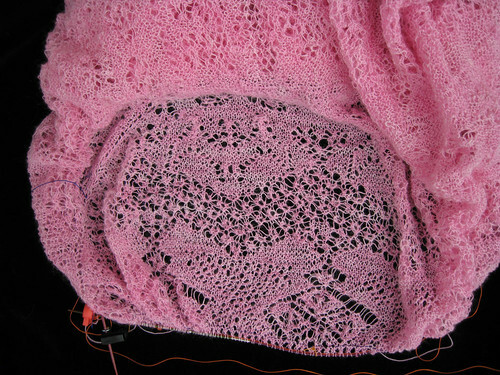 I have been working on two interminable projects--the King Bat shawl and the Iris stole. I am sick to death of both of them, but know that if I put them aside, they will slowly mutate from WIP to UFO. I have invested too much knitting time in these two objects to condemn them to UFOness. 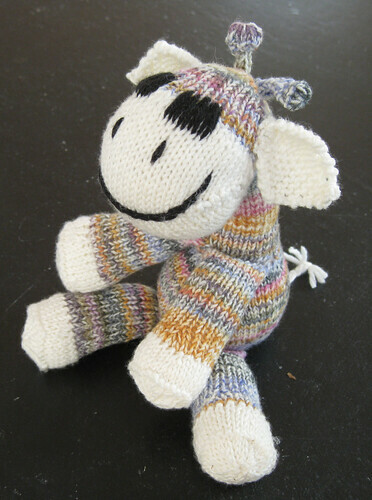 So, in the spirit of Silly Season, I present Douglas, the Extremely Happy Giraffe. 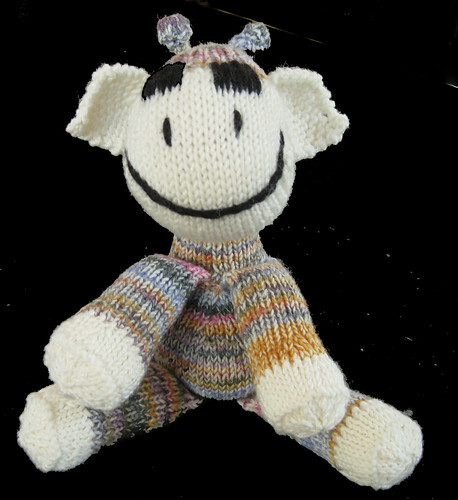 This charming pattern, and may others equally adorable, are available for free from Bobbi Padgett. I have an urge to work the hippo, but haven't decided what color it should be. Pink and purple hippos are so common, gray is so dull, and green seems a little too peculiar. Douglas here will become the personal pet of Nina, the daughter of a friend living in Japan. Let's wish him bon voyage and hope he enjoys sticky rice!